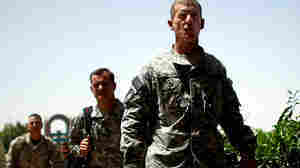 July 29, 2010  A new report by the U.S. Army says nine years of war is taking a toll on troops and commanders who aren't trained to look out for clues that a soldier may be suicidal. The study is the result of a 15-month look into the causes of rising suicide rates. July 28, 2010  The Inspector General for Iraq Reconstruction says the U.S. government can't account for $8.7 billion in reconstruction funds for Iraq. Also, Gen. James Mattis, in his confirmation hearing, told senators that if confirmed as chief of U.S. Central Command he will immediately focus on the Afghan fight. July 27, 2010  Marine Corps Gen. James Mattis' nomination is being considered Tuesday by the Senate Armed Services Committee. He is likely to face questions about remarks he made in 2005 about killing members of the Taliban. Is Director Of National Intelligence A Viable Post? 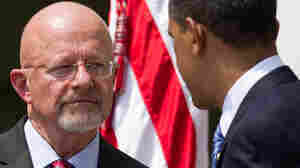 July 20, 2010  Retired Air Force Gen. James Clapper begins the confirmation process Tuesday as he seeks to become director of National Intelligence. Senators aren't convinced anyone can successfully head all 16 U.S. spy and intelligence agencies. July 12, 2010  Under a new rule announced Monday, veterans will no longer have to prove that a certain attack, bomb explosion or event in a combat zone triggered post-traumatic stress. It's a change that most agree has been a long time coming. July 5, 2010  The alleged Russian spies arrested in the United States were not charged with espionage. After years of living in the United States, they apparently did not gather much information. But the threat of spying does still exist, even if it's gathered in a Cold War way.